Software can automatically back up data of MS SQL, MySQL, PostgreSQL, Oracle and any other database, as well as the message base of the MS Exchange. Any type of data can be copied without stopping other processes using these data, saving both the time and user efforts from unnecessary pauses. 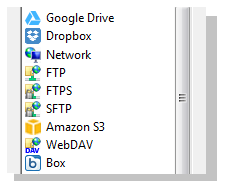 You can back up your web apps and web content freely with Handy Backup, using FTP/SFTP/FTPS protocols for remote servers, or back up server data locally. Handy Backup is capable to save the perfect image of any server, physical or virtual. It supports any type of virtual server engine, including Hyper-V, VirtualBox and VMware. You may automate saving copies of any of your mission critical business apps data, including files and folders selected by name and/or extension masks. 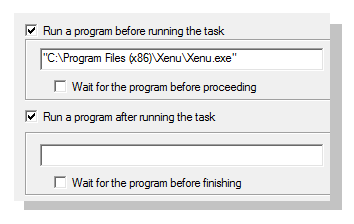 To provide full control over actions, all the program activity is logged. This is also the possibility to notify users about any performed action via E-mail. Handy Backup can be started as Windows service, doing the scheduled job automatically, producing up to no distraction by users operating with the same machine. Any modern external storage, be it HDD, SSD or NAS, is fully compatible with Handy Backup. The Small business backup software can store data at any of popular cloud services such as Amazon S3, Google Drive or Dropbox, and HBdrive. Backup tasks can be tuned flexibly by scheduling these tasks, as well as supporting full, incremental and differential backup, rotating backup versions and other options. Other programs, such as compression utilities or antiviruses, may be executed automatically before or after any task, to control other aspects of security. You can perform small business backup of files, folders, databases and disk images using a single program for all of it. There is no more cost-effective solution for such a functionality! Automated features for all data types include popular databases are greatly reduce the time for setting your backups, as well as the classical, intuitive interface. All data are stored in native formats, allowing using these data with typical tool such as Windows Explorer. Time stamps and automated restore also quicken the restoration process. Use cases and best practices allowing using Handy Backup in a most effective way are published and discussed on a regular basis on the official product websites and in social networks.